On January 20, businessman Donald J. Trump became the 45th president of the United States. In the Oval Office he found telephone sets for both secure and non-secure calls, which were installed under his predecessor Barack Obama. Trump called them "beautiful phones", but nonetheless some small changes were made, apparently to better fit the image that he wants to present of himself. As Trump continued twittering there's speculation whether he still uses his very unsecure old Samsung Galaxy S III or a new phone that has been properly secured. At the moment this isn't clear, also because there are no photos yet showing Trump using a smartphone as president. This issue will be discussed when more information becomes available. and the older Cisco 7975 IP Phone with expansion module. January 24, 2017. The wooden box with presidential seal is an emergency call device. 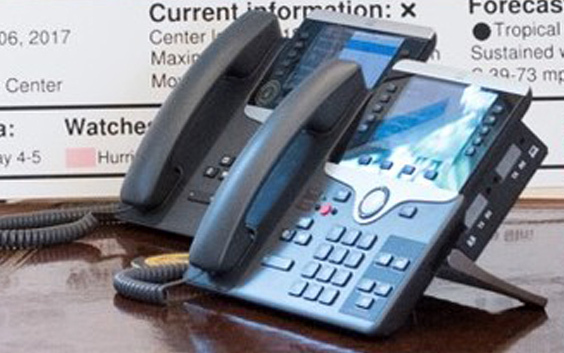 - On the left: a new Cisco 8841 IP phone, which is part of the internal White House telephone network and can be used for all non-secure calls. This network was modernized since 2015, but the phone was not placed on the president's desk until late 2016. On the back of this phone is a black metal box and on the front panel there's an extra red button, both of which are modifications by Advanced Programs, Inc. (API) in order to meet Telephone Security Group (TSG) standards, including on-hook security for the handset and the speakerphone and probably also for TEMPEST protection. These modifications are to make sure that the phone cannot by any means be caused to produce or transmit audio when the handset is on-hook - whether accidental or deliberate. It's not for securing the calls by means of encryption. - On the right: an older Cisco 7975G Unified IP Phone with expansion module 7916, which is for the highly secure Executive Voice over Secure IP-network connecting the president to all major decision makers, like the secretaries of State, Defense and Homeland Security, the Director of National Intelligence and top military officials. This telephone network became operational in 2006 or 2007, but this particular phone is on the president's desk only since early 2011. Elsewhere, these phones usually have a bright yellow bezel or faceplate instead of the standard silver one, indicating they may be used for conversations up to the level of Top Secret/SCI. 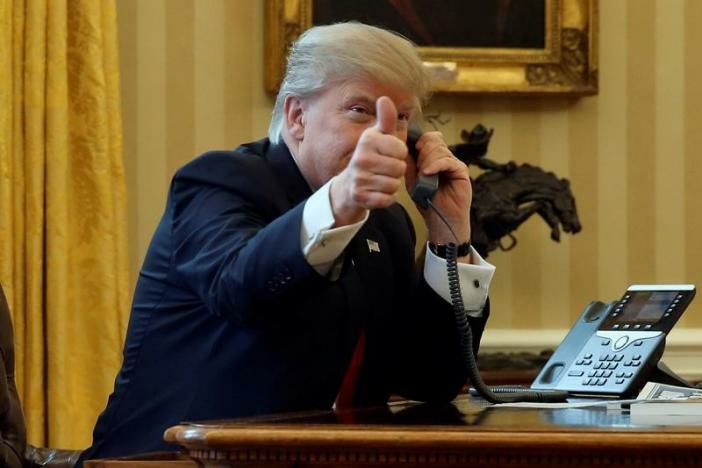 Based upon the photos that have been published, president Trump used the non-secure telephone for calls with German chancellor Merkel and Saudi Arabia's king Salman, while the secure one was used for phone calls with Russian president Putin and Australian prime minister Turnbull. This means that these latter heads of state have been provided with the necessary encryption systems to set up a secure communication channel. In an interview with The New York Times on January 25, president Trump said "These are the most beautiful phones I’ve ever used in my life" - which may sound a bit strange as both are regular models for management and executive positions in large businesses and organisations. In this case it's understandable though as in his Trump Tower office, there's just a mid-range Avaya/Lucent 8410 office phone from the mid-1990s with a tiny monochrome display, where both phones in the Oval Office have large full-color screens. Apparently referring to the Cisco 7975 for the secure Executive Network, Trump added that it is "The world’s most secure system - The words just explode in the air" - a rather odd way to say that these calls are highly encrypted and therefore impossible to intercept with the express purpose of course that the words do not dissappear in the air but reach the other end uninterrupted. - Instead of the Cisco 8841 IP phone modified for security reasons, there's now the regular commercial version of this telephone set, so without the additional box at the back and the red button on the front. With the expansion module attached, the older Cisco 7975 IP phone was quite a large device, so probably Trump wanted to have it smaller to make room for all the paperwork he likes to have spread out on his desk. Apparently he saw no need for having the extra direct line buttons, probably because he can always have a Situation Room communications officer connect him to anyone he wants, but it may also symbolize that there's only a very small number of people that he is in contact with. The reason for replacing the modified (and therefore more secure) Cisco 8841 by a regular version is more puzzling. It doesn't make the device smaller, nor easier to operate. The only thing is that the box on the back, the small red button and the silver anti-tamper seals draw some extra attention to the device. That doesn't sound like a very big deal, but according to a report by The New York Times, visitors to the Oval Office said that Trump "is obsessed with the décor — it is both a totem of a victory that validates him as a serious person and an image-burnishing backdrop — so he has told his staff to schedule as many televised events in the room as possible". 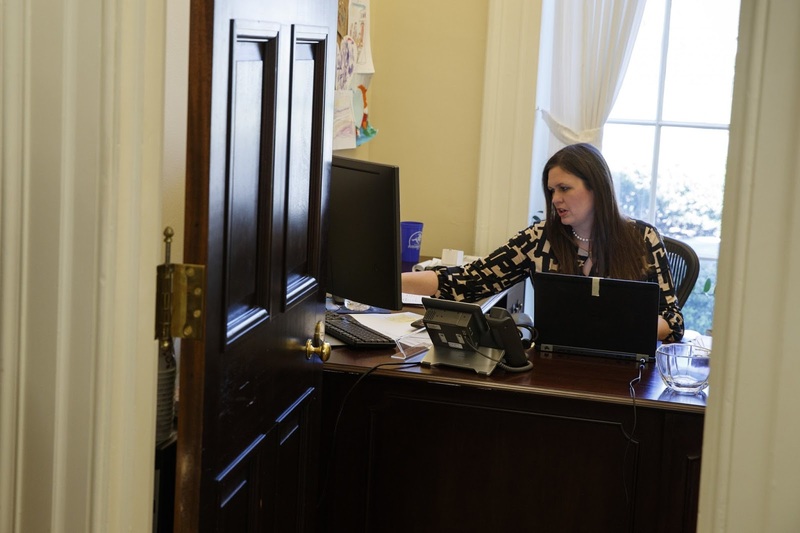 So with the two telephones being necessary, they had to be as less distracting as possible: no sophisticated technical security improvements to gaze at, as well as leaving more space for the papers - everything to focus on Trump as a hard working president. The piles of paper may be more suggestive than real though: like in his Trump Tower office, they are not just official reports and memos, but also include newspapers, magazines and printed web articles, from which Trump learns the news as he seems to have difficulties with reading more complex texts. But the papers also work rather chaotic, just like every aspect of his presidency so far. Earlier presidents used to have their actual paper work not in the more ceremonial Oval Office, but for example in the little-known small private study right next to it. The Treaty Room in the residence part of the White House was also used as a private study, especially during the evening hours. 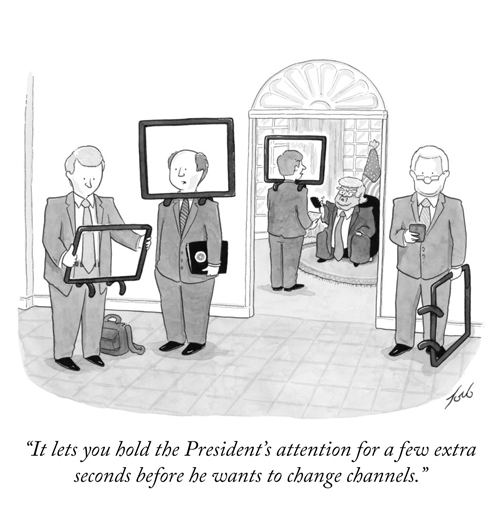 President Trump however favors watching television shows, which he impulsively comments on twitter and seem to be his primary source of information. 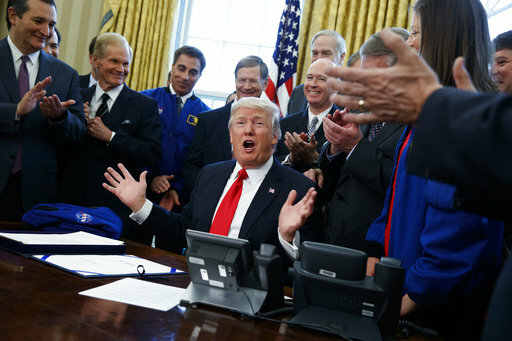 The two Cisco IP phones on the president's desk on March 21, 2017. At the moment we can only guess about the reasons for these changes, but it's seems possible that, as a reader commented here, Trump "had the phones changed because he doesn't trust whatever was left around by the previous administration" - which fits a story about White House aides who became paranoia and fear that career intelligence employees are working to undermine the new president by monitoring their phone calls, emails, and text messages and subsequently leaking this information. 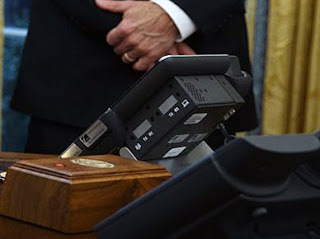 Ultimately by September 2017, the old Cisco 7975 IP phone for the secure presidential telephone network was also replaced by the newer Cisco 8851 or 8861, but without the additional black box on the back side - probably because secure calls are encrypted, which mitigates the risk that adversaries can use the phone's microphones for eavesdropping. 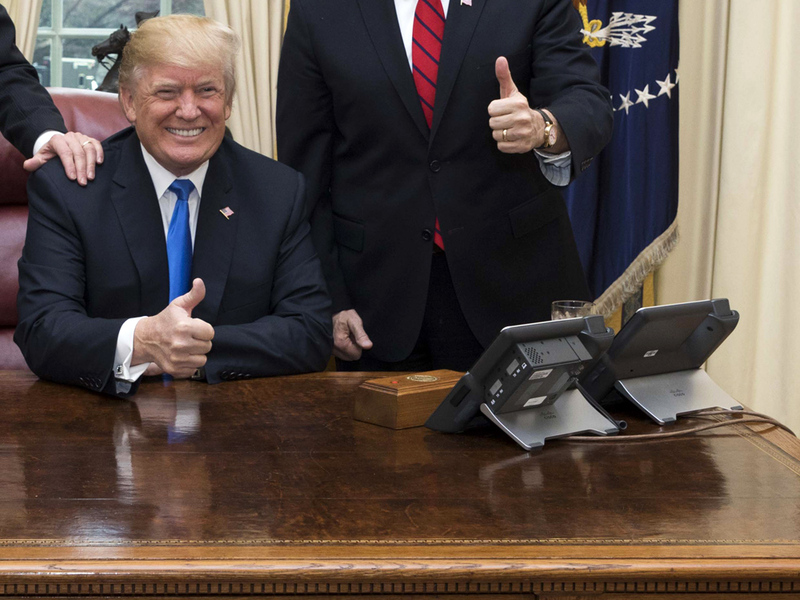 Two new Cisco IP phones on president Trump's desk, December 20, 2017. 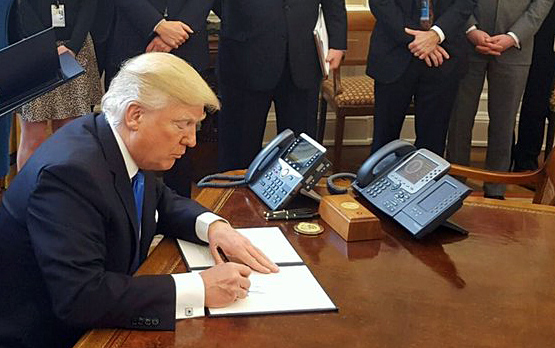 Close-up of the two new Cisco IP phones on Trump's desk, September 7, 2017. 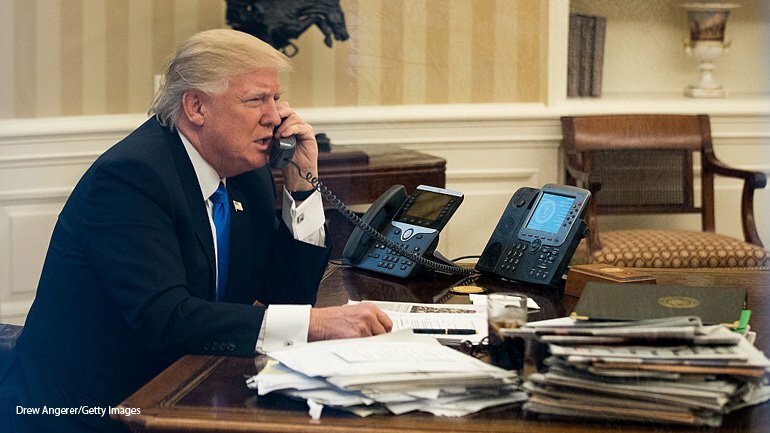 Trump wants his country's physical borders to be extremely secure, but he clearly has much less feeling for and experience with securing classified or sensitive information, illustrated by apparently preferring a regular Cisco 8841 IP phone on his desk, instead of the modified version that secures against sophisticated eavesdropping techniques. Maybe he thinks that such risks are exaggerated by the intelligence and security people he is so skeptical about, but in the late 1990s it was for example suspected that the Israelis had penetrated and could listen into the (non-secure) internal White House telephone system. Such a lockbag is used for securely transporting classified documents, notably a method that Trump prefers, as he told reporters in response to questions about Russia's hacking of the Democratic party: "It's very important, if you have something really important, write it out and have it delivered by courier, the old-fashioned way because I'll tell you what, no computer is safe." Earlier, Trump said that computers "have complicated lives very greatly" and he himself doesn't use a computer nor e-mail, while his smartphone appears mainly for twitter. A big difference with president Obama, who used an iPad for government business and also received the President's Daily Brief on his tablet computer. Trump however doesn't like to read long and nuanced intelligence reports and now gets much shorter daily national security briefings covering only three topics, typically no more than one page each. To keep the president's attention, intelligence analysts were even instructed to only include facts that support their analyses and not cover topics from different perspectives. - Ned Price: I didn’t think I’d ever leave the CIA. But because of Trump, I quit. Excellent work, as always! Thanks for publishing! Other companies are making modified 88XX series phones without the backpack. Some can even do fiber still so I'd say he probably just got a different modified 8841 or 8851 (hard to tell which model this is). In my opinion, POTUS had the phones changed because he doesn't trust whatever was left around by the previous administration. Any ideas what the devices shown here are? There will be a blog posting about those devices very soon! Melania and Donald Trump are moving in together. The First Lady and 11-year-old son Barron will finally move to the White House this summer, according to People. There are also a couple of secure phones in the oval office that you can't see. They are in previous photos of Obama at the desk, but have been relocated to a more desecrate location very near by. This was originally done because Obama thought they looked too old tech even though those phone could reach anybody in the world at any classification level which is something the current new phones cannot do. It is always very interesting and thrilling to read about presidents or big shots of the big countries especially like a super power. 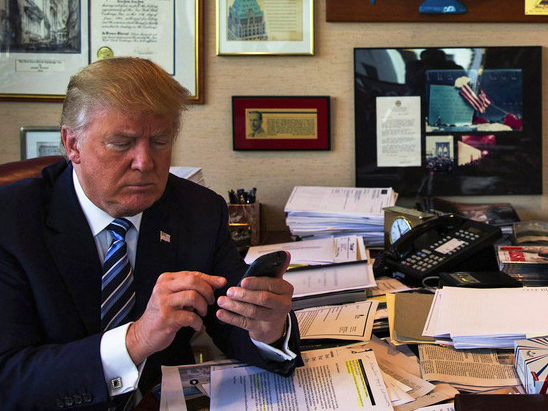 It is amazed to read that Donald Trump doesn’t use computer or an email. Great write up. I wonder if the phones are tapped! In the photos of him using the unsecured and the secured phones, the captions indicate the one with more buttons is secure. In your photo of the two phones side by side, however, the caption says that the phone with the presidential seal is secure but that's the one with fewer buttons. Can you clarify? Seems like the one with the seal is unsecured but I dunno. Thank you for the question - it's confusing indeed, and it may seem a bit counter-intuitive, but the phone with less buttons and additional security features is the actually one for secure (encrypted) communications. The reason is this: the normal phone for regular calls is actually quite vulnarable to eavesdropping attacks, as it is connected to the public telephone network, which means anyone can break in somewhere in a telecom facility, select the lines to the White House and try to makes sense from even the sleightest sounds, or manipulate the signals in order to turn on the microphone while the handset is on hook. The additional buttons and the box at the back side of the phone are meant to prevent these things. For the phone that is used for secure calls it is much easier: it's connected to a separate encryptor box, which encrypts all the voice traffic, so someone who would be eavesdropping would not be able to make sense out of it. Also, these secure calls are routed through dedicated, secure network links, similar to a VPN, which mitigates the risk of manipulating any signals. Because of this, the telephone set for secure calls doesn't need the additional security features. Awesome article. Loved this more than you can imagine. There is a third phone in some pictures as well.. looks like part of an older whitehouse key system or older pbx. Can only imagine they keep that because of the wiring and older paging functions etc. You got a really useful blog I have been here reading for about half an hour. I am a newbie and i read about here on your post this is valuable for me. Please remove the URL to "[The] Museum of Telephony"
It is a direct violation to the site's branding policy and use of URLs outside the site. The information regarding the phone systems would have been much more enjoyable if you had resisted the apparent urge to attempt to insult and belittle the President.